What's a nice bug like you doing in a place like this…? 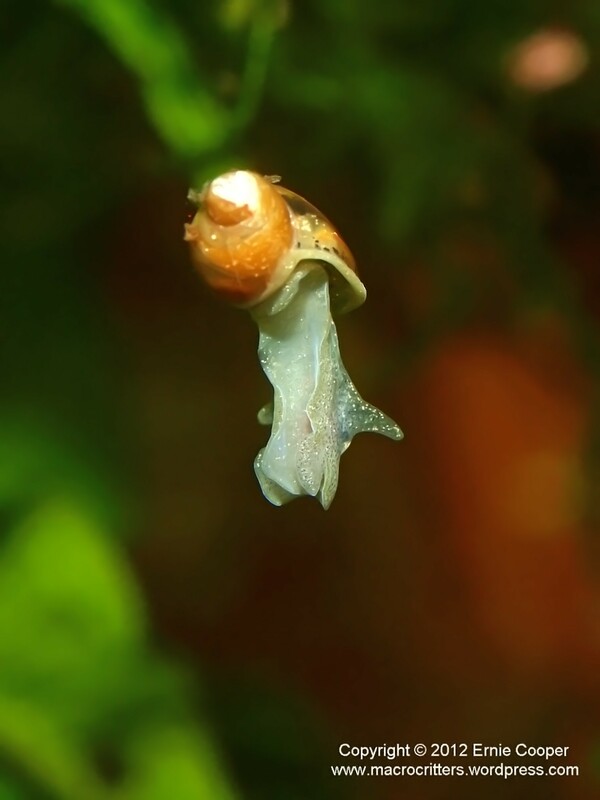 I was walking past my aquarium today and saw this little pond snail suspended in the water about half way between the surface and the bottom. 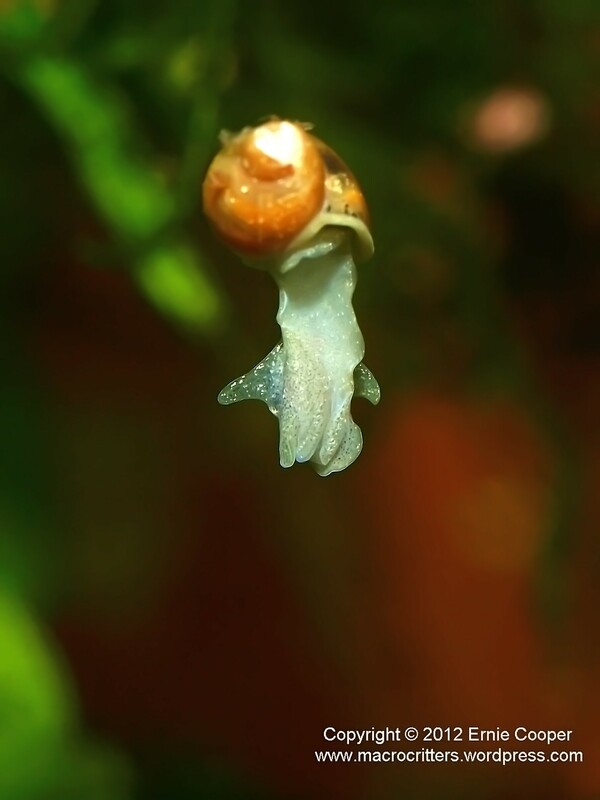 When I looked closer I could see that the snail was veeeeery slowly sinking and had its body extended as if it was trying to reach the bottom. 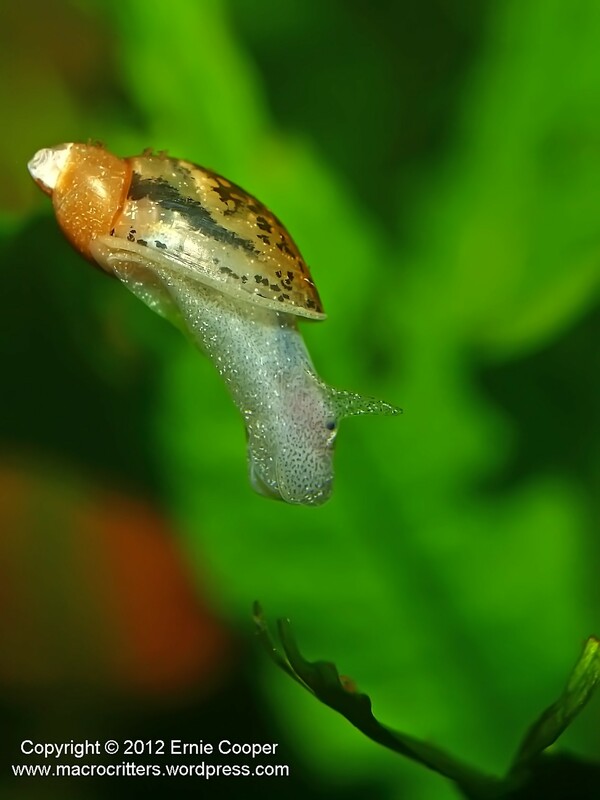 Although these snails are entirely aquatic, they have lungs and need to go to the surface to breath. Any time I look in the aquarium I can expect to see a few specimens on the glass either at the waterline, or crawling back down from the surface. This is the first time I’ve seen one take the elevator down! I grabbed my camera (and discovered the battery was almost dead, naturally) and took these few photos. The snail was a few inches away from the front glass, so I couldn’t get as close as I would have liked. Photographing through that much water unfortunately reduced the resolution of the photos. Plus, I had to make do with the on-camera flash which meant (given the amount of water I was shooting through) having to settle for an aperture of F5.6 and shallow depth of field. I didn’t want to use an ISO higher than 100 because I was going to have to crop the images considerably. It’s a bird…it’s a plane…! 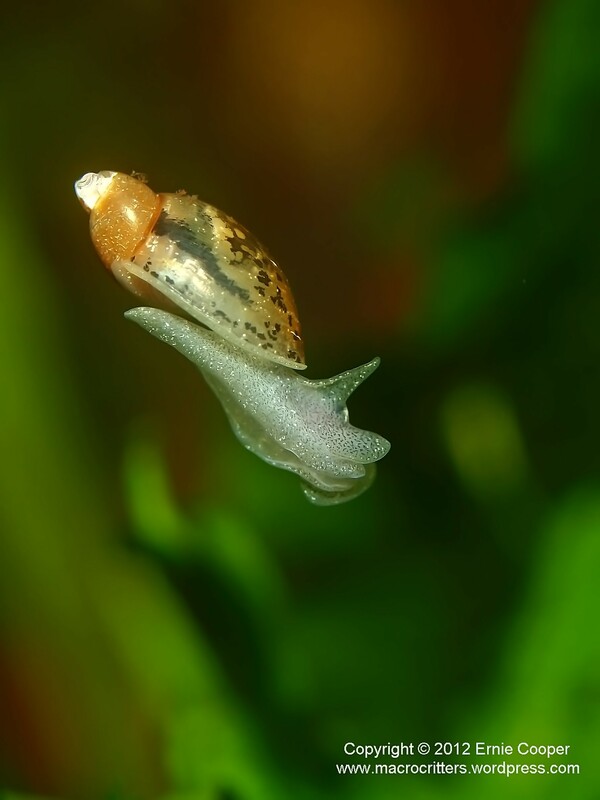 The snail slowly drifted down to a perfect landing on a submerged plant. It was totally opportunistic of course, but it almost looked like the snail had targeting that plant. These photos below were taken as the snail sank through the water column with its body slowly twisting from side to side. 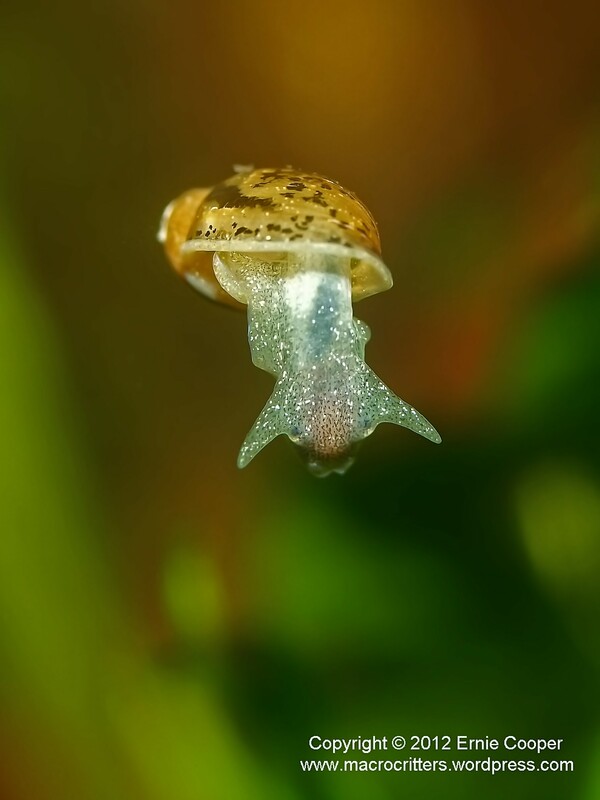 The photo at the top of the page is actually the last of the series: taken as the snail was extending its body towards the plant it was about to land on and looking for all the world as if it was flying! 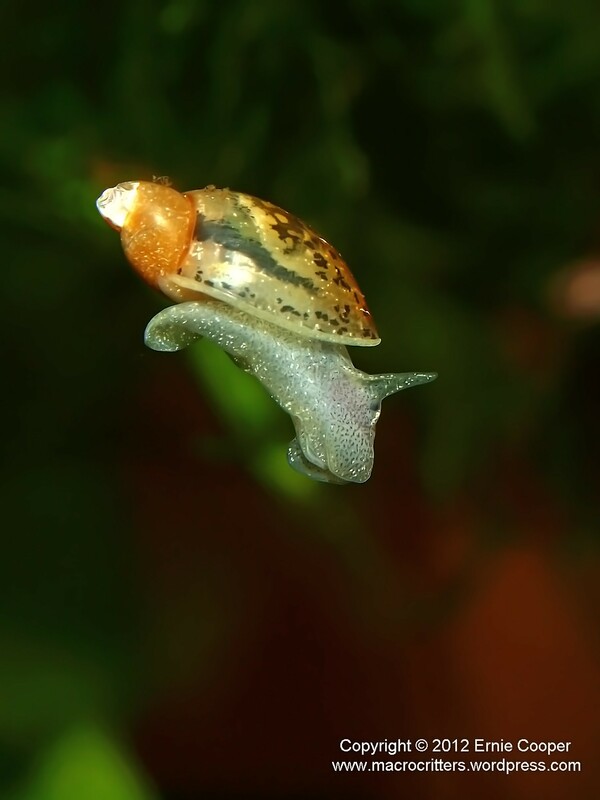 So the life of a snail is not without excitement!